If you are reading this chances are you are a teacher, perhaps a parent, perhaps neither, perhaps both. Chances are you have also been a teenager. If not, I really wouldn’t worry about reading any further, that includes if you have forgotten what it was like. We are living in a world of labels, and I’m not talking just designer clothing. We are all pigeon holed in one place or another, we belong, we don’t belong, we know where we are, then the rug is pulled and we lose our footing. Those of us with the dubious title of adult have to qualify our role on a daily basis, and quite honestly if we are honest with ourselves make it up as we go along. Particularly when the title Adult also gets followed with Parent. Let me qualify something here, parents for me are caretakers of the young, Birth parents, Adoptive parents, Foster parents, Grand parents, Step parents, God Parents, Aunties, Uncles, friends etc. Well you get the picture. As they say, it takes a village to raise a child, which pretty much makes us all Parents of the young people we share this world with. So what the F**k are we doing right now? I did not like being 16. I was convinced there was an imminent nuclear threat about to end civilisation, it caused me many sleepless nights. I was scared witless by a new pending global epidemic called AIDS. I couldn’t enjoy a movie night out without Tombstone laden adverts. 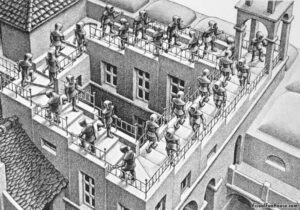 I’d got mediocre grades at school in spite of having worked my hardest and was told without A’ Level success my life would be condemned to nothing more than an eternal Escher stairwell. I was told my dancing days and therefore future would be limited (due to lack of confidence not talent) well that truth didn’t exactly enhance my performance skills for later life, oh and then my Dad died suddenly. I was 17 and just a little bit screwed. As a Step mother now I’m not sure my generation has remembered just what harm unleashed fear can do to young minds. Today there is DAISH, Trump, Brexit and entrenched UK racist and fascist hatred it seems to lifted the veil on (deliberate pun intended), there is Cyber bullying of unimaginable degrees and a brief look at the any reality T.V show will show you that the size of a woman’s breasts will buy her 15 minutes of well paid Air time and ‘fame’ faster than any Noble prize winning brain she might possess. A popular Press that describes a 16 year old than runs away with her teacher as a sexually ‘Groomed’ victim but a 16 year old that run’s away to Syria to become a Jihadi bride as an ‘Adult’, no room at the Inn for Fundamentalist ‘Grooming’ here it seems even if it cost her life. No wonder our young adults are struggling to know where they belong when the ‘Adults’ in charge cant even get their perspectives or stories straight. My point is we might be listening to our young but are we hearing them? If they challenge authority they are ‘disruptive’, even if, in our hearts we know the authority is flawed. If they dare to dream unconventional dreams we tell them they are unrealistic, overambitious, delusional or we just nod vaguely and sit content in the knowledge that unfed dreams eventually just die a natural death. If they are exuberant we tell them they are over active instead of looking at the reduced priority given to Physical education in schools. If they struggle to concentrate we blame ‘lack of focus’ instead of looking at the sugar laden, low nutrient, cheep food being marketed towards lower income families. A quick thank you by the way Mrs May for giving in this week to the sugar and fast food industry, the diabetics and heart attack sufferers of tomorrow will be thrilled you took such inert steps towards child health this week. If in doubt take yourself back, count to10, or 20 or 100 and remember would you really go back to being 16? if you, like me the idea alone brings you out in hives, then try to remember how scary being an almost adult was and teach them how to rationalise fear and to be brave, well at least how to fake it until they realise that they actually are truly brave. Wings were meant to enable flight, Our young people deserve a life that doesn’t ground them and we are ALL responsible for ensuring that doesn’t happen. As for this thing called adulthood I still hate sleeping in the dark and prefer to hear and feel my big dogs heartbeat near at night, and I love to wear fairy dust even though it gets everywhere and on everyone, but then I think I might just make up my own rules whilst I’m considering the others. If your still reading…May your wings always carry you forward.